Celebrating 20 years of honoring Empty Nest! 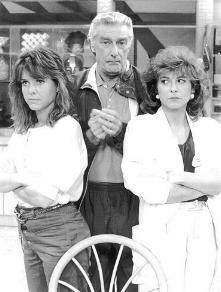 Empty Nest makes its debut October 8, 1988, as a companion piece to the immensely popular Golden Girls. 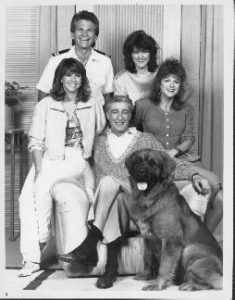 The pilot introduces us Dr. Harry Weston, a recently widowed pediatrician; his two daughters: Carol, a bitter divorcee, and Barbara, a carefree undercover cop; Charley Dietz, a mooching neighbor who works on a cruise ship; Laverne, Harry’s down-home nurse; and Dreyfuss, the lovable dog. Harry struggles with living alone, reentering the dating scene and an empty nest, all with the aid of his daughters and dog. His wife, Libby, has been dead 18 months at the start of the series. We get doses of Harry’s whole life as the action shifts from his home to his cozy office at Community Medical Center. With its cushy 9:30 timeslot following The Golden Girls, Nest becomes an instant Top 10 hit, receiving strong reviews and a loyal audience. Never a soapbox sitcom, Nest establishes itself as a warm and entertaining show its freshman year, remaining lighthearted instead of overly issues-oriented. Midway through the season, Harry’s nest ends up full once again. He persuades a financially troubled Barbara to move back home, and the two begin butting heads immediately when Harry sees how irresponsible his daughter is. Lonely Carol soon decides to return home as well. Having Harry, Barbara and Carol under one roof creates more possibilities for storylines and adds an ironic twist to the show’s title and concept. The first season lets us get to know the characters, which all stay close to their basic concepts. The bumbling Harry is thrust back into the dating world right from the start when a lady friend informs him that their weekly meals together are actually dates. As the season progresses he finds himself getting more and more comfortable with dating again, while still holding on to the memory of his wife. He sparks a relationship with a woman but gets nervous when the two plan a weekend trip together. When an organ ordered by Libby before her passing finally arrives, Harry becomes obsessed with learning to play it in hopes of holding on to the past. Having broken down after her divorce from cheating husband Gary, Carol jumps at the chance to have dinner when he calls for a meeting, hoping to make him see what he gave up and regret doing it. She hits bottom again when finding out that he just wants to give her the last alimony check. Meanwhile, Barbara is proposed to by one beau but backs out on her wedding day and later falls head over heels for neighbor Dorothy Zbornak’s nephew only to get dumped herself. The rocky relationship between Carol and Barbara is established this season as the two very different sisters argue over everything. In one episode, Harry offers to take them on a trip to Paris if they can go one month without fighting. Other episodes this season include one in which Carol begins dating an old friend of Harry’s; Harry begins a crusade to save his office space when a new corporation threatens to relocate him; Laverne is forced to quit when her husband is transferred to Phoenix, causing Harry to spring into action for a solution; and Carol causes a fiasco at the hospital after exposing the mental problems of a beloved clown.